Something has happened to my jewelry taste in the past few years. I hit 60 and found myself drawn to styles I'd bypassed since the '70s. Out of nowhere has come a Ladies Who Lunch proclivity for bangles, whimsy and heavens-to-Betty Draper retro styling. Never mind that I don't live this life 98% of the time; my usual lunch is an omlette at a handy diner or sandwich at home. But part of me wants to drape myself on a chic banquette, order a leisurely three courses, and say "si" to a Bellini. Part of this shift is the realization that if investing in good pieces, I'm not wanting to tire of the item in two years. Classic looks better all the time, if I'm choosing now to keep wearing at seventy-five. Here is some of the real stuff, as a reference, and to channel one's inner Babe Paley. The ne plus ultra, $22,000 to about $27,000, depending on width and detail. The translucent paillonné enamel, developed by Jean Schlumberger, and meticulously maintained by Tiffany jewelers, is a collector's item. Ross Simons in their estate collection, these seashell clip earrings evoke summer earrings on a yacht. Price? Contact Seaman Schepps and then your trust officer. This beautifully-modeled piece of whimsy is typical of the company called "America's court jeweler." And now for some budget-respecting variations, in the spirit. Each season, J C rew offer a selection of Ladies Who Lunch accessories. 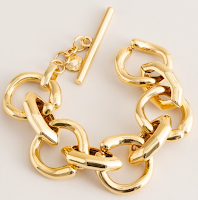 I liked this Estate Link bracelet, which fakes gold, but hey, it's $58. 4mm cultured freshwater pearls and turquoise cabuchons. On sale at Ross Simons for $296.25. 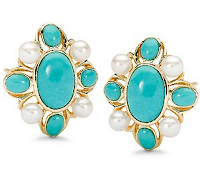 Pearl, gold and turquoise pop against neutrals like an umbrella in a Singapore Sling. Now where is that pool boy? 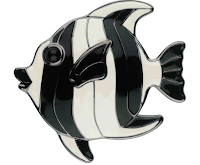 Lulu Guinness' Enamel Fish Brooch was £85 now £42.50. The graphic, cream and black stripes, and the 10.5cm length make it wearable yet striking. 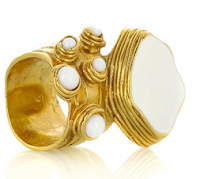 This Yves St. Laurent Arty Enamel Ring has it all: size, detail and wit. Could dress down, relatively, or float up to cocktail time. And it's only $195 at Net-a-porter, available now in sizes 6 and 7, also available in a striking cobalt blue. The ring in black and silver is on sale at Bergdorf Goodman's web site for $137. The original Ladies mixed their real and costume pieces, but that's harder to do today because workmanship in the costume realm has declined: glued-in instead of set stones abound. I returned a Banana Republic piece that, while a ringer for the socialite look, was soulless. 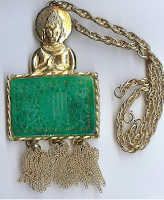 So I'm looking at vintage, and found this carved faux jade and gold-toned necklace that converts to a brooch, by Hattie Carnegie. It's in mint condition, priced at $410 from Ruby Lane seller Gaspee. Though pricier than the BR piece, it has so much more essence. What to wear with LWL accessories? Since I'm not angling for a prize corner table at La Grenouille, I would wear the simplest polished cotton pants and linen shirt. Why compete with your vibrant jewelry? Talbot's also has some interesting LWL-esque brooches in their fall collection. I'm really liking that j.Crew bracelet, but wonder if it's adjustable as my wrists and hands are really small. Bangles and other bracelets tend to slide off which is why I generally stick with the stretchy kind. For my LWL look this coming season, I'm going big on brooches with big cuff bracelets rather than lot's of bangles. I like to go dangling and boho in the spring and summer and sharp and tailored in the fall and winter. This is funny, because a few years ago I started to look longingly at those big clip-on earrings, a stape of the look! PS My daughter bought some Banana jewelry a few years ago and everything fell apart--almost immediately. 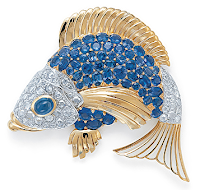 I love the Seaman Schlepps Fish Broach!! Alas, I don't have a trust fund. Goes to show the difference between cosutme and the real thing, even on a computer screen. Love your choices. A couple of years ago I started really looking at LWL jewelry, and particularly noticing and admiring the jewelry worn by my now elderly aunt -- classic Southern LWL stuff, which I had previously disdained. Now I am surprised at how much I would love some pieces like hers. Great choices! Fun! 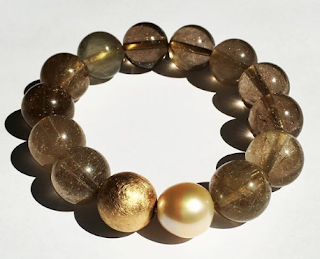 I will probably never run to pricey jewelry but I am much more willing to wear bracelets and brooches than I used to be -- the LWL look, as you say, is having more appeal just for its indulgent whimsey. I have a starfish brooch, silver-coloured and covered tiny rhinestones that I love wearing in summer. A vintage cameo. An enamelled elephant whose ears move and who sports rhinestone eyes. But the LWL piece I'm going to get much enjoyment from, 'cause it also works into everyday very well, is Pater's anniversary gift, a Tiffany bracelet of sterling-silver balls -- next time I'm in To. I'll wear it for our drinks on the rooftop at,what was it, Drake's? You'll, of course, be sparkling in something fab! Beautiful fancies! I love the bracelets. Deja, you might want to try real Indian bangle bracelets (usually 22 k gold) which tend to be quite a lot smaller than the regular Canadian gold ones. In India the girls help each other squeeze their hands so they got into them and then never take them off. I´m ashamed to admit, that only the real stuff interests me nowadays. I like to wear very little jewelry ( I have renewed, traded nearly all my former jewelry ). The pieces I now have satisfy me completely, and I hope I can hold `my horses´, and from now on only admire jewelry without an urge to buy something. I have noticed that this need to renew myself is going on with clothes, shoes, furniture, everything. Have you Duchesse experienced it ever? Here I go off topic again..
Vintage jewelry has so much life and soul in it. I love shopping for these pieces as well. Oh yes. And aren't bracelets and watches the only jewelery we can truly enjoy while wearing? How many times has someone complimented your earrings, and you have to reach up to your lobes? Wear all of the above with this fall's dramatic draping, or the classic shawl, scarf, or ruana! And, try etsy for fun vintage jewelry. Or, as my twins (almost 3 year old boys) say, Neck-oh-lis. Brace-oh-let. Ear. Rings. Please enunciate those syllables, thank you very much! And I still want a heavy silver chain necklace. Doesn't have to be Yurman. Just funky and cheap (so I guess no Yurman for me). Pseu; Diverchic's idea is terrific; do you have a source in your city for Indian jewelry? 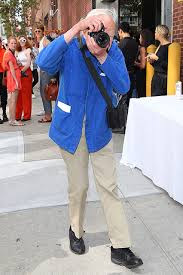 I wanna see those Talbots pieces for sure! Belle: How I would love to see some examples. So are you wearing jackets, or are your brooches on sweaters, or? Mardel: Kicking myself too, that I did not speak up when relatives offered some pieces. mestscan: your question is so interesting I'm going to think, then post... so often you make nuanced observations, Thanks! Frugal and sallymandy- I commented on someone's blog recently that BR jewelry is not worth buying. A careful troll of vintage stores (and you are both queens of that!) would yield much better made costume pieces. Dana: We have twin boys in common. 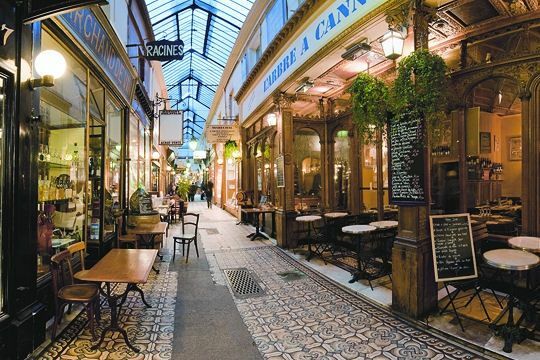 There are many options besides Yurman and do look in vintage or antique stores. True about earrings, but I still fall for them! Duchesse: I´m so glad you got interested, can´t wait for your post. Thanks! I wear a lot of form fitting black sheath dresses and they look great with one big bold brooch, or a group of smaller, more whimsical brooches. In the fall I will be wearing them on jackets. I usually don't wear them on sweaters because of the weight on the knit. I a clip on earrings that were my grandmothers as a necklace, just clip it over a plain chain.